Timo Toikkanen, executive vice president, Mobile Phones, Nokia. The Nokia 207 and Nokia 208 are ideal for use on-the-go, with a familiar, alphanumeric keypad for speedy texts and messaging, and Mail for Exchange for staying on top of work email and calendar appointments. The Transfer app, available today in the Nokia Store, allows people to sync contacts directly from their smartphone (e.g. from the Nokia Lumia range, Windows Phone 8 and most Android smartphones) and transforms the Nokia 207 and Nokia 208 into secondary or companion devices, perfect for travel. The Nokia 208 Dual SIM has the added benefit of Nokia’s Easy Swap technology, allowing people to change SIM cards without turning off the device, to take advantage of more favorable tariffs. Consistent with devices across the Nokia Mobile Phones portfolio, the Nokia 207 and Nokia 208 offer faster and more affordable mobile Internet experiences. Support for 3G coupled with the data compression available with Nokia Xpress Browser help people enjoy rich mobile experiences at lower cost. These experiences include top social apps such as WhatsApp, Facebook and Twitter, alongside video streaming through YouTube and Vuclip. For even greater versatility, people can also use the Nokia 207 and Nokia 208 as a portable modem, simply by connecting the device to their laptop via a USB cable for Internet sharing anywhere, anytime. The Nokia 208 will be available in single SIM and Easy Swap Dual SIM variants. 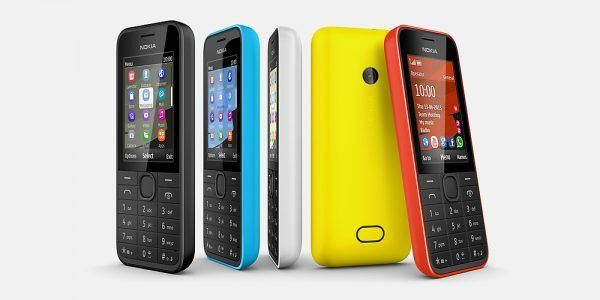 The Nokia 207 will be available as a single SIM option without a camera in Europe. Available colours include red, cyan, yellow, white and black. The estimated retail price for the Nokia 207 and Nokia 208 is US$68 USD (about 52 Euros or £45) and they are expected to start shipping during third quarter of 2013.